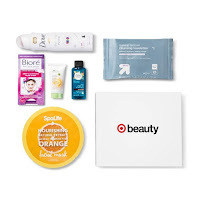 Hurry over to Target.com to grab this August Beauty Box for just $7 ($21 value!). There is a limit 1 box per person. Remember, shipping is free on orders of $35 or more. OR – if you’re a Target REDcard holder, you’ll get FREE shipping on ANY size order and an additional 5% off your purchases! Labels: Target August Beauty Box, Target.com.